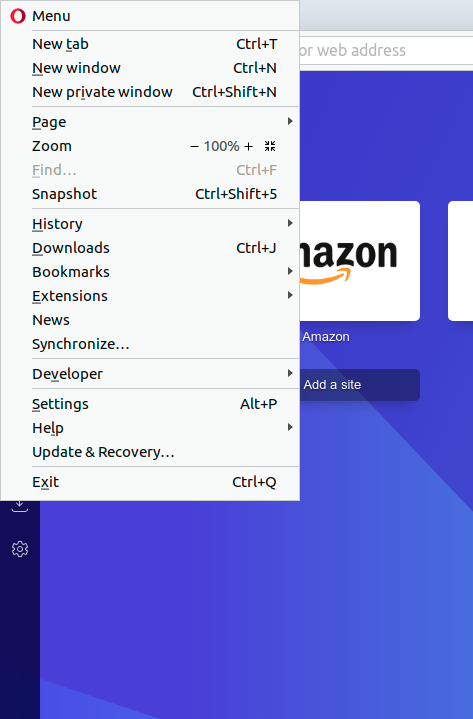 How to prevent this behavior only for Opera browser in GNOME? Because some similar behavior have another programs like Firefox, VSCode.. But in case all another known me programs they just show File Menu when pressed single Alt and don't process next button like menu item. Another difference in behavior of Opera is very sensitive response to pressing Alt. Just need Alt key down and no mater was pressed another key in same time with Alt you will get menu opening in 90%. It must be a bug. On mine, the default is alt-f showing in the shortcuts settings. Even if I change that to something else, the alt key by itself always opens main menu. The same it happens to me in Fedora 29, I've reported the bug, you should do the same.